'Brimmed Cerise Amo' (Austin Morgan, R. 1979). Seedling# M77-11B. TB, 35" (89 cm), Early to midseason bloom. 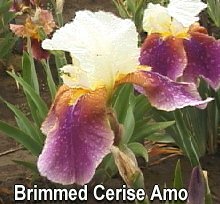 Standards white; falls cerise with irregular lilac edging; yellow beard. 'Stunning' X 'Howdy Folks'. Iris Test Gardens 1981.